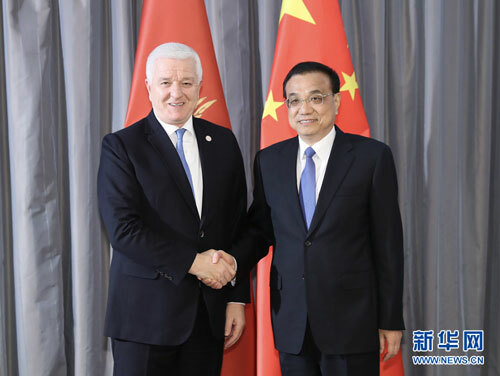 On the afternoon of April 12, 2019 local time, Premier Li Keqiang met with Prime Minister Dusko Markovic of Montenegro in Dubrovnik. Li Keqiang noted that China and Montenegro have maintained a tradition of friendly relations and profound political mutual trust. The Chinese side is willing to enhance cooperation with the Montenegrin side in economy, trade, investment, clean energy as well as transport infrastructure and encourage businesses of the two countries to conduct negotiations based on market-oriented principles. It is hoped that both countries will constantly achieve positive progress in various areas of bilateral cooperation and jointly gain further development of bilateral friendship and cooperation. Dusko Markovic expressed that Montenegro and China share friendly relations, and bilateral relations have maintained good momentum for development at present. The Montenegrin side hopes to step up alignment and cooperation with the Chinese side in areas including transport infrastructure, industries and green energy. The Montenegrin side has actively participated in the practical cooperation between China and the Central and Eastern European Countries, and expects to further bilateral relations to benefit the peoples of the two countries.